Visit the cafe or get the ingredients to make your own delicious winter cuppa. What’s nicer than wrapping your hands around a steaming hot drink on a cold February day? And what’s more restorative than a delicious boost of healthy fats, vitamins and minerals? There are healthy drinks … and drinks that pretend to be healthy. You know, the ones that are mostly sugar with only a sprinkle of something good. Now you can get healthy drinks that are delicious, without the sugar, and with a medicinal dose of the healthy stuff. These drinks are now available in Community Natural Foods cafes, or you can shop in the store for the ingredients to make them at home. Turmeric, a golden yellow spice, has been all the rage lately — and for good reason. It’s a potent anti-inflammatory and antioxidant, and may even have some anti-cancer properties. 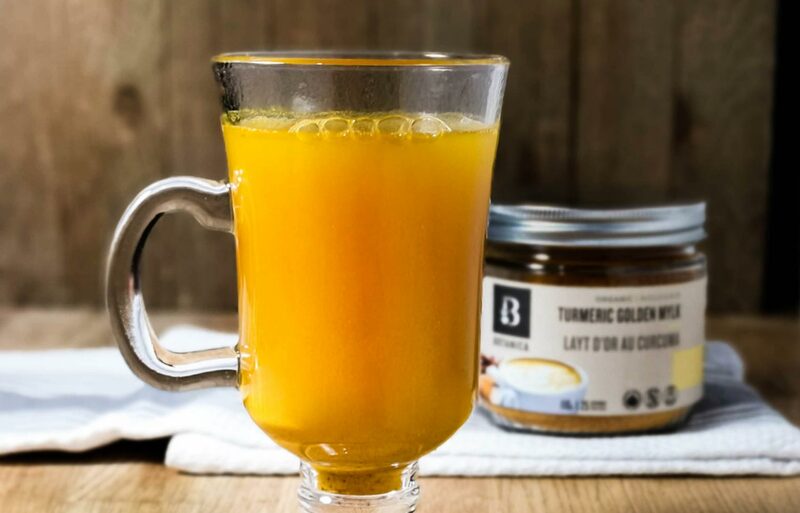 Botanica’s Turmeric Golden Mylk is the Community Natural Foods-recommended option. It’s available in Community Natural Foods cafes or on shelves as a mix to make at home. 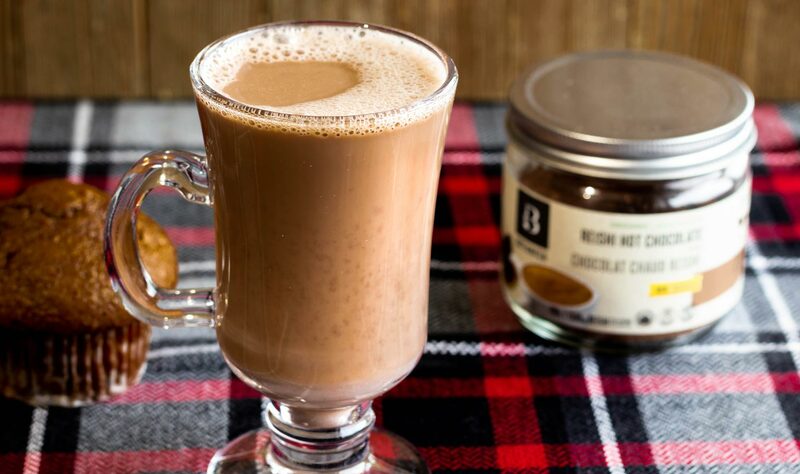 If you love the creamy, chocolatey goodness of hot chocolate but don’t love the sugary high that comes with it, there’s a new must-try drink in town. Reishi Hot Chocolate is an easy way to get a medicinal dose of reishi mushroom (1500mg) in a warm mug of chocolatey creaminess. The reishi mushroom is a medicinal mushroom that has been used for centuries in Asia, and we’re just starting to sing its praises in North America. It’s a fantastic addition during the colder months. Reishi is full of amazing medicinal sugar compounds called beta-glucans, along with a good dose of plant sterols. These compounds can help slow cancer growth, balance your immune system and lower inflammation. With all those healthy properties, it makes sense that Reishi has been given the name “mushroom of immortality” in China. Reishi Hot Chocolate is available in Community Natural Foods cafes or on shelves as a mix to make at home. 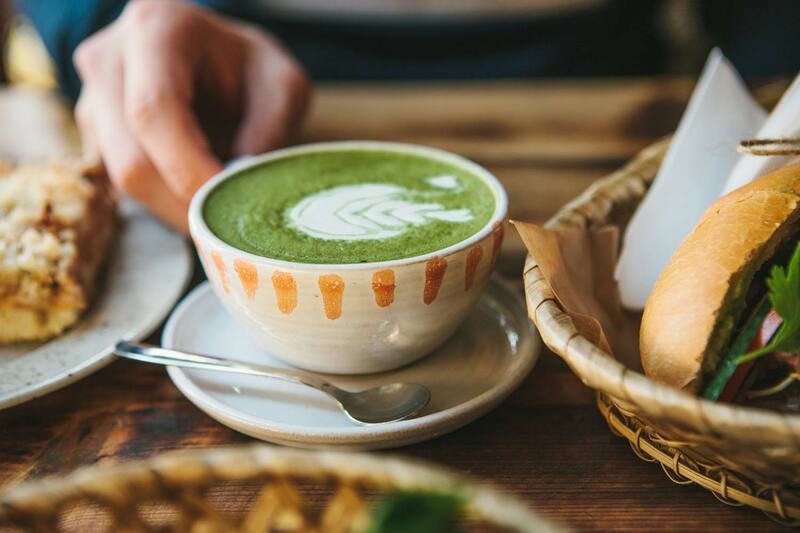 This is an energy boosting and delicious hot beverage made with matcha green tea powder, coconut oil, grass-fed butter, vanilla extract and a touch of sweetness. Order it at a Community Natural Foods cafe or pick up the ingredients from the shelves make it at home using this recipe. Add all ingredients to a blender and process until smooth and creamy. Try these café beverages at the 10th Avenue or Crowfoot Community Natural Foods market/cafe locations. Visit any one of the three Community Natural Foods market/cafe locations on Feb. 9 for a huge Beverages with Benefits sale.